Landscape lighting provides attractive and functional lighting for your backyard, garden, and walkways. A common choice for outdoor lighting is to border the front walkway with lights, marking a clear path and making it easier to navigate when it is dark. Professional landscape lighting can accentuate a particular outdoor space and create a welcoming atmosphere. Outdoor lighting not only increases aesthetic value of the property, but the exterior light creates a natural deterrent to intruders. It is important that your outdoor lighting design creates a natural feel. Lights placed all over your yard with little thought to design will wash out your landscaping and detract from the atmosphere you were originally hoping to create. Whether you need a comprehensive outdoor lighting system or your existing lighting fixtures are in need of repair or replacement, contact the electrical professionals at Hufnagel Electric for all of the design and electrical work. 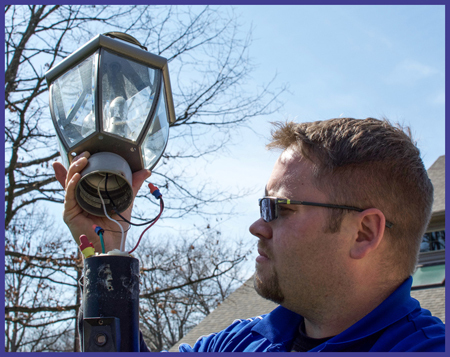 Our licensed, professional electricians are experts at wiring and installing beautiful outdoor lighting and landscape lighting designs and security lighting for homes throughout Pittsburgh and the surrounding areas. What is Grounding, and Why is it Important? We perform all of our services with quality and efficiency – we know that you have a busy schedule, and we value your time. Also, our pricing is fair, competitive, and up front.